Got scraps? Need to use ’em up? I can answer an emphatic “YES!” to both of those questions. I am overwhelmed with scraps at the moment. In fact I haven’t touched my scraps since I made this quilt and that was over two years ago so I have quite a collection. Fortunately I have been sorting them by colour so that should help a bit. I have had a chance to see an ebook version of the new book “Quilt’s for Scrap Lovers” by Judy Gauthier and am pleased to tell you about it today. There are quite a few favourite quilts in this book for me. 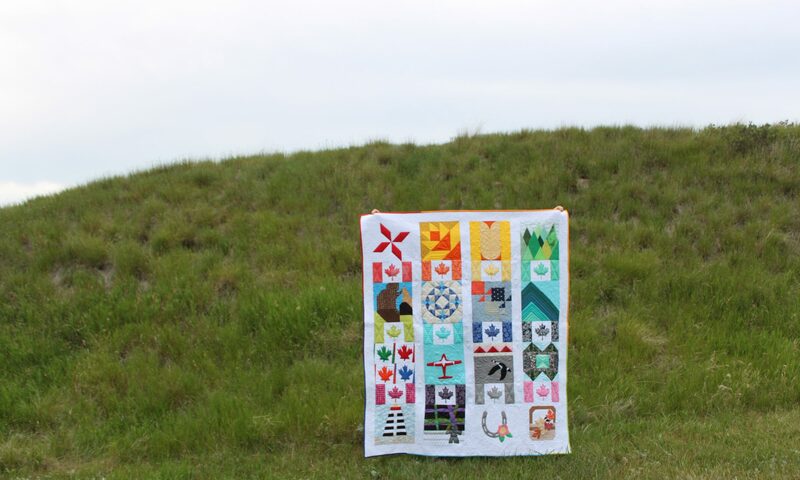 I think my most favourite is the “Arrow-Dynamic” quilt. I made one of the blocks into a rainbow mini quilt. Arrow-Dynamic Rainbow Mini quilt pieced and quilted by Anita LaHay of Daydreams of Quilts. I had fun quilting this one with swirls in the middle and sun rays on the edges. A closer look. This is only my second time quilting swirls so I’m still working on the travelling bit. 😉 Love those dinos from Lizzy House! I used a black fabric from Zen Chic’s “Comma” line for the binding. In the original quilt in the book the blocks are scrappier and made with fabrics of the same colour and value and I like that look too. It only takes four of these blocks to make a good sized quilt using the directions in the book and I definitely want to use up some of my overflowing scraps to do that. Click the book photo to order from C&T Publishing. I have seen scrap quilt books before that suggest cutting all your scraps into certain sizes and honestly I just couldn’t see myself standing at my cutting table and doing that. Judy’s approach makes much more sense to me. She says , “You shouldn’t have to look for a pattern to match your pieces. Rather, you should be attracted by the pattern and then cut the pieces you will need.” Yes! This is much more in line with how I like to work. If you have scraps (and who among us doesn’t?!) and you’re looking for a scrap quilt book that makes sense and has fun patterns then click here to get your copy and start making fantastic quilts and using up your scraps at the same time. Arrow-Dynamic rainbow mini quilt made by Daydreams of Quilts. By the way, have you signed up for my newsletter?! This fun free printable calendar page is going out in today’s issue. See this post to see the cute quilt planning page that everyone receives when they sign up. And there’s a free quilt pattern too! Sign up today 🙂 so I can keep in touch. Thank you to C&T Publishing for providing me with a digital review copy of this book for my review. Linking up with Fabric Tuesday and Let’s Bee Social. This post contains affiliate links. This means that if you click those links and buy I will receive a small commission. Thank you for your support! Beautiful quilt. Will be looking to purchase this book. Beautiful swirls for the 2nd time! Great job! I like that book, too. Luckily my good friend bought it so I get to borrow it. I like the arrow quilt, simple but fun. What a cute mini! I love things in rainbow order. The swirls are a good motif, too; the arrows swirl around and the quilting mimics that. Your mini is so pretty, Anita! Love the mix of scraps you chose and the quilting looks fantastic! Next PostNext Are We All Burning Ourselves Out? And if so, for what?